Thanks to Joan and Phil who brought this to our latest gourmet group’s gathering. No better way to top off a menu of Tuscan delights than with this remarkable treat! Remove 4 (2-inch) strips from lemon with vegetable peeler. Place in bowl of small food processor with sugar and anise seed; cover. Process until peel is finely ground. Add ricotta cheese and vanilla; cover. Process until smooth. Spoon into large bowl. Gently fold in whipped cream. Cover. 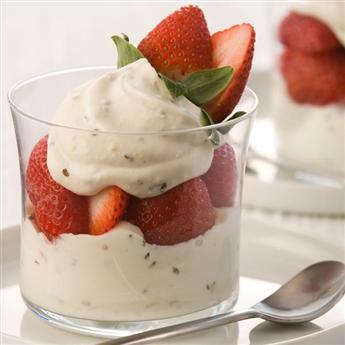 Layer strawberries and anise-ricotta cream in 8 parfait glasses. Garnish each with a whole strawberry, if desired.